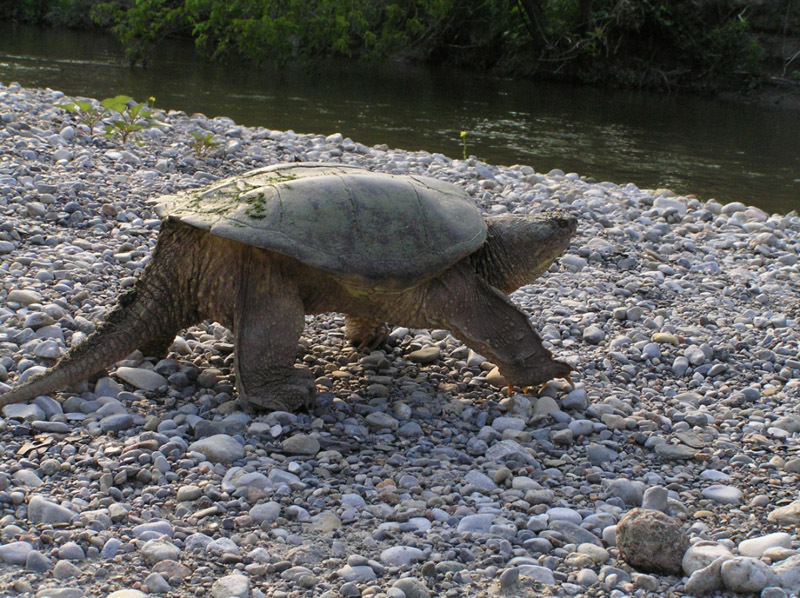 The largest of Ontario’s turtles, a snapping turtle’s upper shell (carapace) can measure 48 cm. Adults typically weigh between 4-16 kg but can reach over 30 kg. 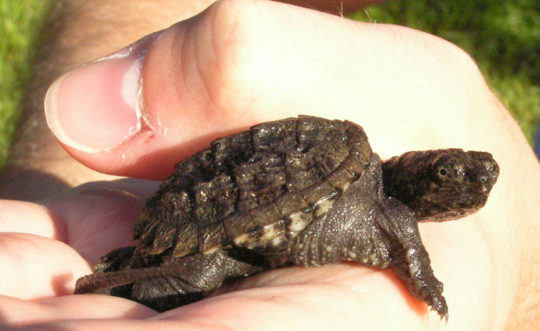 The relatively small lower shell (plastron) is cross shaped. They have a large head and the upper jaw is slightly hooked. Their skin is rough and warty in appearance. When young, three low keels are evident on the carapace. These lines are less noticeable as the turtle ages and the carapace is often algae covered. The rear edges of the carapace and the top of the tail are saw-toothed in appearance. Plants and a wide variety other aquatic life including leeches, snails, insects, crayfish, and fish. They will also scavenge dead animals. Snapping turtles are well-known for their ability to defend themselves on land. They can move with remarkable speed and have strong jaws that can inflict damage to skin. While in the water, they prefer to simply swim away or remain hidden at the bottom. They rarely bask on land. They hibernate from October to May usually in the mud or dug into something like a muskrat lodge. They reach sexual maturity around 13-19 years of age and usually mate in the spring but this can occur anytime during their active season. Females will seek out egg laying sites in June or July. These sites are exposed to sun and have loose, well drained soil. The same site may be used for years and a female will travel up to 10 km to her preferred site. She will lay between 20-40 ping pong ball sized eggs which will typically hatch in September or October. Quiet, slow-moving waters with muddy bottoms and plenty of plant growth. Although their population is widespread, they have a low recruitment rate which means very few young reach adulthood. Once they reach the adult stage, they have few predators and can live a long time, usually up to 50 to 75 years. In the past, this long life ensured that enough eggs would be produced to sustain the population. However, too many adults are now being killed because of road traffic, illegal harvesting and persecution. 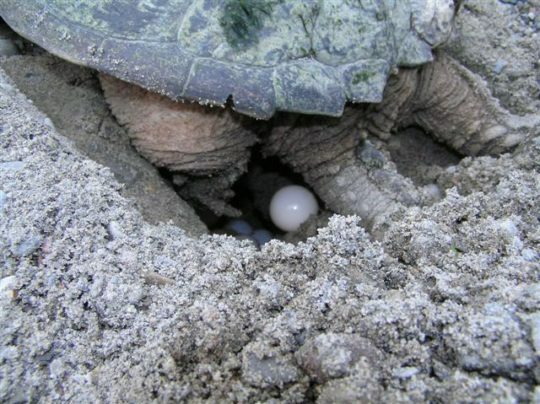 This combined with an increase in the raccoon and skunk populations in many areas has led to a high predation rates of turtle eggs. 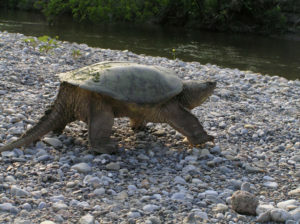 The combination of these factors led the Committee on the Status of Endangered Wildlife in Canada (COSEWIC) to list the Common Snapping Turtle as a species of special concern in November 2008. Watch out for turtles and other wildlife while traveling on our roadways. If safe to do so, please “herd” or carry the turtle off the road. Try to place them in the direction they were traveling. For snapping turtles, the easiest and safest method is to use a shovel or paddle to scoop under the turtle. A snapping turtle can be also be moved safely by grabbing the back of the shell (above the hind legs) on both sides. Only lift the turtle just off the ground. It may seem like the neck can reach you but you are safe at the back of the shell from a bite. A pair of work gloves stored in the car can help prevent a scratch from their claws. Never lift a snapping turtle by the tail. You can injure the spine which may lead to the death of the turtle. Keep your garbage and compost inaccessible to animals like raccoons. Help dispel the myth that snapping turtles are dangerous in swimming areas.